Brussels, 2 May 2018 – After six months of low positivity, business confidence in the European advertising and marketing sector rose significantly at the beginning of 2018, according to the latest European Advertising Business Climate Index, issued by the European Association of Communications Agencies (EACA). The latest report shows that business confidence in the ad industry increased 12 points from +1 in January 2018 to +13 in April 2018. It is the highest level of confidence measured over the past year, close to the previous peak of +16 points reported at the end of 2016. 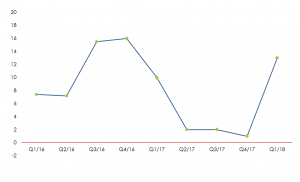 The European-wide confidence index could rise further over the next quarter, as the expectation of advertising demand increases from +8 points (Q1/2018) to +21 (Q2/2018) and the expectation of selling prices grows from +7 (Q1/2018) to +9 (Q2/2018). To a considerable extent, the growth is driven by the UK, which has the largest share of the advertising market in Europe. The confidence index for the UK has risen an impressive 75,4 points from -26,2 (Q1/2018) to +49,2 (Q2/2018). It has gone from having the second lowest score measured across all the countries in the last quarter to now having the highest. The expectation of advertising demand in the UK also rises 80,8 points from -11,9 to +68,9, between Q1 and Q2/2018. Among other positive confidence gainers are the big advertising markets in France and Italy, increasing respectively from +1 to +4 and -28 to -18 over the last quarter. Whereas Italy’s confidence index used to be the lowest of all the European countries, the bottom rank is now occupied by Greece with -35 points. It has had the biggest decline of all the countries over the previous quarter (25 points). Despite the earlier poor expectations, the evolution of demand taken as a whole in the beginning of 2018 has increased from +1 to +16 and the evolution of employment has risen from +8 to +11 between Q4/2017 and Q1/2018. The expectation of employment remains stable at +10 points for the next quarter with the exception of Mediterranean Europe, where the situation is expected to deteriorate (from +6 to -9). Expectations of prices in Mediterranean Europe are also the lowest of all the European regions but, on the other hand, they are expected to rise more than in other areas (from -3 to +4). Two countries that have most improved their overall business confidence over the last quarter are the UK (from -26,2 to +49,2) and Estonia (from -4 to +8). The biggest falls in confidence are experienced in Greece (from -10 to -35) and Denmark (from +33 to +18). Click here to access all the previous press releases of the European Advertising Business Climate Index. In order to get access to the full reports, please get in touch with EACA on info@eaca.eu. 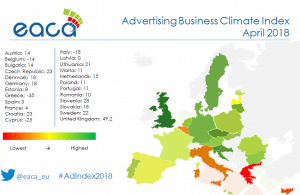 EACA will publish the next edition of the European Advertising Business Climate Index in August 2018.